MARC Cars Australia has signed some of Australia’s brightest young stars for its 2018 Liqui-Moly Bathurst 12 Hour campaign. A host of young talent will be given the opportunity to tackle the Mountain alongside an experienced core group of drivers – and even international imports – that are staples in the ever-growing MARC Cars program. 2017 Supercars Mike Kable Award recipient Will Brown will rejoin fellow 2017 class I winners Keith Kassulke and Rod Salmon in the No. 91 MARC II V8 – one of the outfits new generation cars. The trio will aim to defend their class victory achieved in the 2017 race, where they finished 17th outright in a close battle with their teammates in the No. 92 car in the closing stages of the race. The victory this year was Salmon’s third at Bathurst, joining his two outright victories achieved driving for the Ralliart Mitsubishi squad in 2008 and 2009. Meanwhile, another 12-hour class winner will return for another shot at getting to the top step of the Bathurst podium, this time in Class I.
Tony Alford, Kyle Alford and Chad Parrish will share the Donut King MARC Cars Australia entry, with Alford a three-time winner of Class C (GT4) with victories in 2012, 2014 and 2015 – and second in 2013. Morgan Haber will re-join MARC Cars after a strong debut season in the Lamborghini Supertrofeo European series, and will join Jake Camilleri and Young-gun Aaron Cameron another of the new generation V8 machines. Cameron caught the eye of team boss Ryan McLeod after a tip off from Former World Karting Champion John Target who, with Supercars ace James Courtney, supplied JC Kart chassis to Cameron for his campaign in the elite KZ class of this year’s Australian Karting Championships. Meanwhile. Gold Coast teenager Zane Goddard will debut for the team next February – having returned home from Europe having scored pole positions and race victories in the British Formula 4 Championship. 2017 CAMS Australian Formula 4 champion Nick Rowe will make his third start at the mountain for MARC cars. The West Aussie driver recently impressed in his maiden Supercar test for BJR following a dominant season in the domestic F4 series in which he won his maiden title for AGI Sport. “All of the drivers we’ve worked with from Formula 4 are really very high level” he said. “Even though the MARC car is completely different to a junior open wheel racecar, it’s easy to see the F4 graduates are very adept, and gel quickly in the new environment. Former British Touring Car Championship Independents Cup champion James Kaye will join Tyler Everingham in a car, with a third driver yet to be named. The British driver is not unfamiliar with Bathurst, having started the 1994 Bathurst 1000 driving a Toyota Carina with Greg Murphy – finishing 23rd. He then returned in the two-litre Bathurst 1000 in 1997, driving a Vauxhall Vectra with John Cleland. Meanwhile, Geoff Taunton will be joined by regular co-driver Jason Busk and Dunlop Super 2 Series regular Bryce Fullwood in his privately entered entry. The team will confirm further driving combinations in due course, and is still in conversations with several drivers to fill the final seats in the squad. 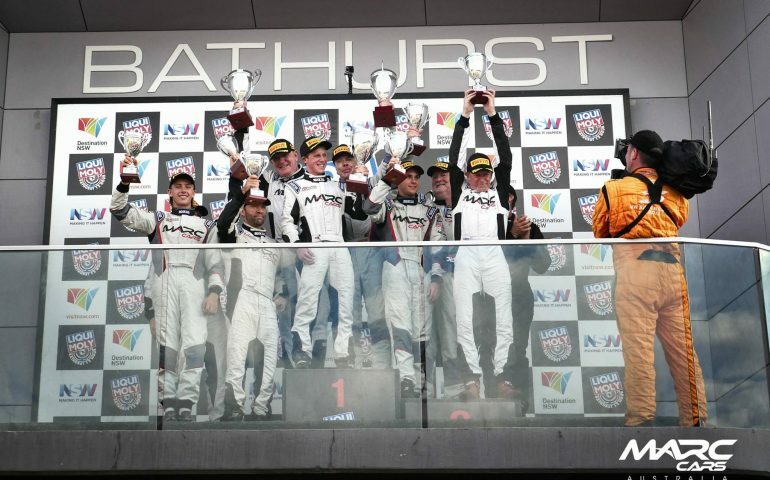 MARC Cars Australia will announce further components of their Liqui-Moly Bathurst 12 Hour campaign within the next week.